Hair Color guests at Studio B Hair Salon have an array of choices. The staff consists of two hair color specialists and five hair color, design and styling service providers for those who prefer to have their services rendered by one single person. 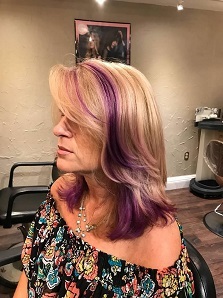 Every hair colorist puts their signature on your look, however our goal is always to achieve an artistic approach to an end result that will compliment your features, hair characteristics, and desired design cut. 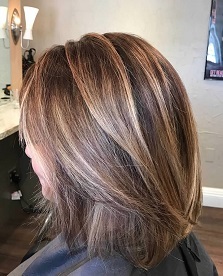 Our hair color team will always try to take into consideration the condition of the hair before we begin a color service. Sometimes minerals, products, medicine, and other substances can build up on the hair shaft. Doing a pretreat to cleanse the hair is often necessary. Especially in the case of well water this is a must. In other situations, it is necessary to do a protein treatment in order to build the integrity of the hair. Because each client has individual needs, consultations are complimentary and necessary. Permanent single or double process, this service will lighten the hair and should not be pulled through to the ends on each service. Our color refreshing glazes are the best choice for faded hair. 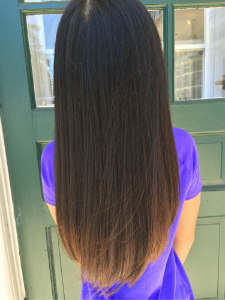 Demi permanent may be used for shine or to refresh color and hi lites but is very popular at Studio B Hair Salon as an overall color when no lift is required. Also it leaves the hair with integrity. We agree with Redken “THE HAIRCOLOR THAT THINKS IT IS A CONDITIONER. Hi lites – THIN, THICK, WEAVED OR SLICED, YOUR CONSULTATION IS SO IMPORTANT HERE. We also do partial, face framing, halo or just a few hi lites. It is up to you. Low lites can help to add depth and dimension. 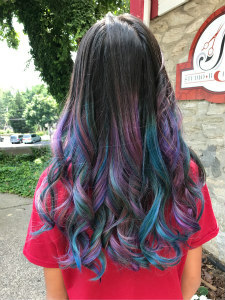 Freeform color is the latest craze. This is truly a customized way of using the architecture of your style to place color in a concentrated place. Corrective color is a term used whenever we need to fix something undesirable that was previously absorbed by your hair. Sometimes this cannot be totally accomplished in one day and is priced accordingly. COLOR FOR MEN !!!!!!!!! NOW WE CAN PERFORM SUBTLE OR COMPLETE GREY COVERAGE IN JUST 5 MINUTES !!!!!!!! IF GOLD TONES ARE YOUR FEAR, FEAR NO MORE WITH CAMO COLOR WE CAN FADE OUT GREY WITHOUT ANY FAKE WARM TONES. Men also get great haircuts at Studio B Hair Salon! !